Developed by Icy Waters Ltd. over the past thirty years, Yukon Gold™ Ova is Icy Waters' peerless proprietary strain of commercially available Arctic Char (Salvelinus alpinus). Backed by years of research and continual monitoring, Yukon Gold™ Ova have been successfully grown on four continents. Each ovum presents countless hours of time and significant investment to ensure the highest quality is available to our customers. Possessing industry leading hatch out rates, low maturation and high disease tolerance, Yukon Gold™ has become the world standard for growers. 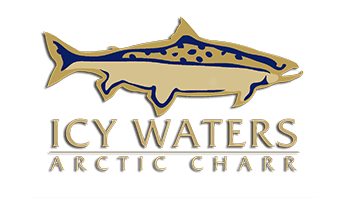 Icy Waters Ltd. is dedicated to providing our customers with superior service. Support is available over the phone or by email free of charge. If needed, an onsite consultation can be arranged for a modest fee. Unlike other strains, Yukon Gold™ Ova is available for purchase semi-annually. Spring ova are available in May/June and fall ova are available in November/December. For additional specifics, please download our information about Icy Waters Yukon Gold™.